LCL injury recovery time is needed after every Lateral Collateral Ligament sprain or tear. 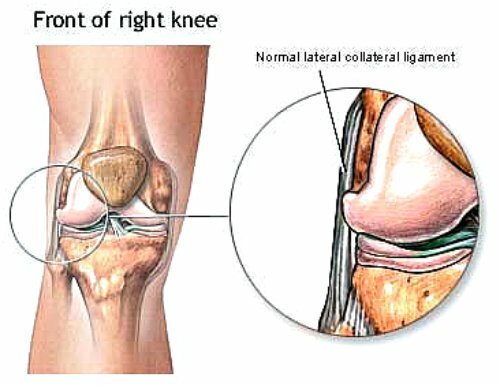 When it comes to LCL ligament injury, time is the best healing process, and surgery is rarely required for treatment of common lateral collateral ligament injuries. Getting over LCL knee injury will need proper time to heal, combined with treatment and exercises to strengthen the Lateral Collateral Ligament before returning to any activity. Proper LCL sprain treatment will depend on how severe the Lateral Collateral Ligament injury is. Whenever an athlete feels like he/she has a knee injury, no matter what knee ligament is in question, he/she should step off the field immediately and apply ice over the injury. Running in soccer may mask the real extent of the injury until the body actually cools down. Injury may feel less severe while the body is warm, and by staying on the field and playing through mild knee pain, player can cause a much worse injury of the LCL ligament, leading to much longer time to recover from the injury. I say this from personal experience; when you feel like something is wrong with the knee, simply trust your body and immediately step off the field. Every LCL injury treatment should start with letting the pain subside, use of RICE method, working on knee mobility, followed by strengthening exercises. Compressing the knee during LCL rehab is a great way to give additional support to the knee. As I mentioned above, only very severe LCL ligament tear will require surgery, however each degree of the LCL tear treatment will require different LCL rehab steps to properly heal. Time away from activity is the biggest factor for different severity rehabilitation. Grade I injury to the LCL ligament is caused by a mild sprain, that stretches the LCL ligament too far, causing pain when the ligament is touched or whenever the knee is fully bent. Small swelling may occur as well. MOST IMPORTANT treatment for lcl injury is RESTING from any activity that involves running. Take 2-4 weeks to rest the knee. Apply RICE (Rest, Ice, Compress and Elevate) to accelerate the healing process. Anti-inflammatory medicine can help with swelling. Knee exercises will help with the mobility and strengthening of the LCL ligament. Grade II LCL knee ligament injury occurs with a more severe sprain or impact to the outside of the knee. This leads to the LCL ligament to stretch beyond its limits, tearing some of the ligament in the process. Grade II LCL Injury will follow with more severe pain, swelling and instability of the knee. Grade II LCL injury requires 4-6 weeks (or longer) rest from any activity that involves running. Use of hinged knee brace in the early stages (first 2 weeks) for injured knee ligament support whenever the knee is bent. RICE method (Rest, Ice, Compress, Elevate). Knee exercises once the pain subsides will help with the mobility and strengthening of the injured LCL ligament. Athletes will be able to return to their sport when there is no pain directly over the Lateral Collateral Ligament, or any symptoms of instability. Grade III LCL ligament injury is considered the most severe, as a complete tear of the LCL ligament occurs. Grade III LCL injury major indicator is the instability of the knee and inability to walk as the knee feels loose and buckling under weight put on the leg. Pain is not an indicator, and in many cases Grade II injury may feel much more painful than a Grade III complete tear of the LCL ligament. Bruising and swelling can be expected instantly, with inability to walk. Use of crutches or a knee brace is recommended during the first couple weeks after the injury occurs. Immobilizing the knee should not last more than a week, because early range of motion will help in the healing process. Walking with progression to jogging as the pain subsides and allows to do so. Use of hinged knee brace is very helpful to keep the knee stable, especially during the early stages of LCL Grade III rehabilitation. RICE (Rest, Ice, Compress, Elevate) to help with faster recovery. Knee exercises to strengthen the LCL ligament 4 weeks after an LCL tear. Athletes will usually need 3 - 6 months before returning to the sport, and should only return when there is no pain in the LCL ligament area or any instability noticeable. With Grade III LCL ligament injury, IT IS BEST TO SEEK A PROFESSIONAL OPINION. Grade III LCL ligament injury may include other knee ligaments being injured, so SEEING A DOCTOR is crucial for long term recovery of the knee. For more information on knee injuries and rehabilitation visit LCL Ligament Sprain and Treatment.